Rare experience and exceptional location in typical and authentic Biarritz. The sea a few steps away, an islet of tranquility, in the shade of a flowery park and in the middle of the "Quartier des Halles", the heart of local life. 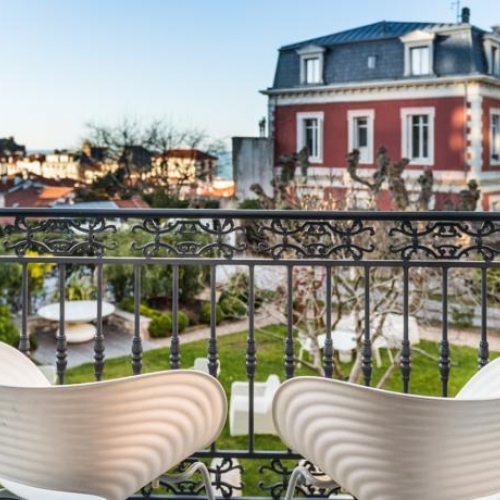 Hotel de Silhouette is located in the historic center of Biarritz. The requirement of quality, comfort, luxury, and calm is essential as soon as you arrive. Refinement of the decoration adapted to each of the 20 rooms of this building dating from 1610 which opened its doors in 2011. Terrace and park arranged for your breakfasts, improvised brunches, quiet diners or simple break lulled by the sea scents ... Secure private parking is reserved for our visitors.